From Solar Impulse II, the solar airplane flying around the world, to PlanetSolar, a speedy solar catamaran that circled the globe, or GROVER, a NASA rover trekking across an icecap, these pioneers chose the best: SunPower. Why? It’s simple. We design and manufacture the most efficient1 and durable2 solar technology on the planet. For the past 30 years, we’ve constantly demanded more of ourselves, never settling on being a conventional solar company. Most solar companies look and sound the same, but SunPower has a unique story to tell. It was our collaborations with these pioneers that inspired our technological innovations — and our new advertising campaign, Demand Better Solar®. Here's what Erin Mulligan Nelson, Executive Vice President and Chief Marketing Officer, has to say when it comes to answering the question: How is SunPower different? From our early years, we’ve had a long history with NASA. We developed solar cells that powered the space agency’s early generation unmanned air- and space-craft. One named Helios set a world record when it was flown to an altitude of 96,863 feet in 1999. NASA’s success with solar flights inspired the two Swiss pilots who founded the Solar Impulse solar airplane projects. In 2006 we helped develop the first prototype airplane using our high efficiency SunPower® Maxeon® solar cells. 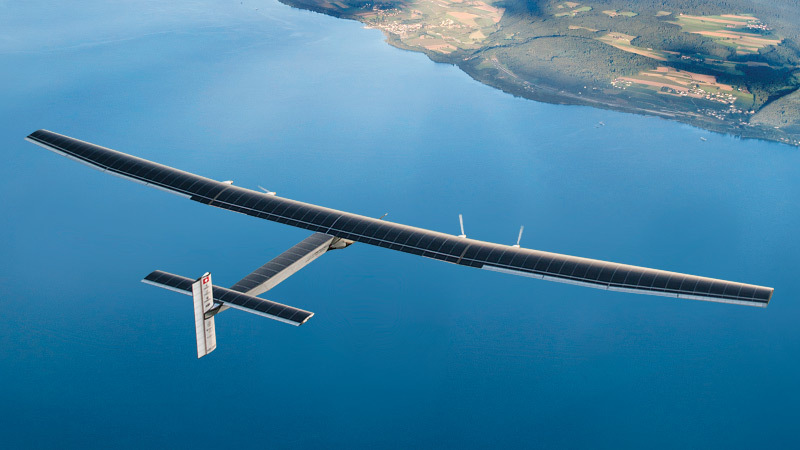 And just last July, the second-generation solar airplane, Solar Impulse 2, also powered by Maxeon cells, broke world records for making the longest solo and solar-only flight when pilot André Borschberg flew it 5,000 miles from Japan to Hawaii. We also provided solar technology for PlanetSolar, which at the time was the largest and fastest solar-powered boat in the world. The catamaran completed its circumnavigation of the globe in 2012, breaking two world records. And in 2013, our solar technology powered NASA’s Greenland Rover, an autonomous vehicle carrying a ground-penetrating radar. GROVER roamed Greenland’s ice sheet to study how snow accumulates on the Greenland ice pack to help scientists understand how the massive ice sheet gains and loses ice. On its launch day the rover withstood winds that blew up to 23 mph at a frigid -22 degrees Fahrenheit. So, of course you don’t have to fly a solar airplane around the world to enjoy the fruits of the most efficient1 and durable2 solar. We apply that same spirit of innovation to build the best quality solar product to power your home or business. In the coming weeks we look forward to chronicling some of these great solar pioneers’ stories on our SunPower Blog in hopes that smart solar shoppers will be inspired to do as they did: Demand better solar. Click here to get our latest blog post delivered by email. Visit our YouTube channel to watch a clip from our new Demand Better Solar® TV commercial. Interested in purchasing the same solar that powered these amazing solar projects? Visit our solar calculator to find out how much you could save going solar with SunPower.